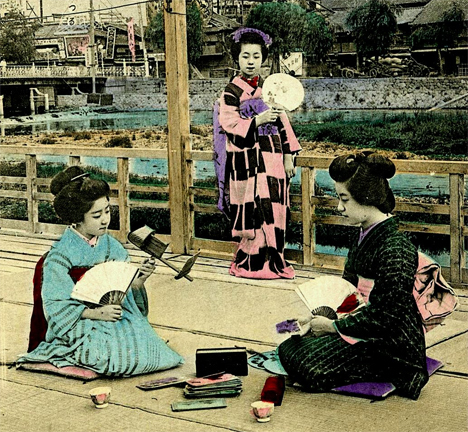 Photographs of Japan from the Meiji and Taisho Periods (1868-1926) have captivated viewers around the world since they were first circulated. One photographer in particular captured Japanese life so beautifully that his work has been seen by countless people all across the globe. Until very recently, though, his name was virtually unknown. Now we know that the prolific photographer’s name was T. Enami – or rather, that was his trade name. He was born Enami Nobukuni, and his work made a deep and far-reaching impact on photography. Some of T. Enami’s most popular and memorable works were his stereograms: two nearly-identical 2D images taken from slightly different angles that, when viewed together through a stereograph, appear three-dimensional. Here they are animated to give the 3D effect, but all of the originals can be seen on Okinawa Soba’s Flickr collection. Enami started his career as a traditional photographer, but later embraced the more “modern” stereoviews and lantern slides. Judging from his carefully staged stereograms, he approached his work with a great deal of attention to detail. The colors on these stereograms were all hand-painted, and the resulting product was sold around the world. Today, collectors treasure these exquisitely detailed antique images. T. Enami ran a photography studio in Yokohama until his death in 1926. His work spanned a multitude of areas, including postcards, large-format prints, private portraits, glass transparencies, photo processing and print-making, and numerous commercial photography projects. His photographs have appeared several times in the pages of National Geographic, a true honor for any photographer. One of his half-stereoview images was even used on the cover of their 100th-anniversary book Odyssey: The Art of Photography at National Geographic. Despite his monumental contributions to early Japanese photography, T. Enami’s identity was not widely known outside of Japan until around 2006, when his descendants shared information about him with biographers and collectors. He was the only photographer of his era known to work in all contemporary commercial and artistic formats, and it can be said that his work has been seen by more people than that of the more established “masters” of his time. The appropriate credit is now being given to thousands of Enami photographs that were previously unattributed or simply attributed to the wrong photographer. Enami is now, finally, in his rightful place amongst the most influential early Japanese photographers. A detailed biography of T. Enami can be found at T-Enami.org, and even more of his animated stereograms can be found at Pink Tentacle.